Leather Seats, Cooled Seats, Bluetooth, Premium Sound Package, Rear View Camera! Compare at $35935 - Our Price is just $34888! Blending muscle car styling with modern performance and technology, this Dodge Charger is a full-size sedan with attitude. It delivers even more performance than you might expect given its level of comfort and day-to-day usability. 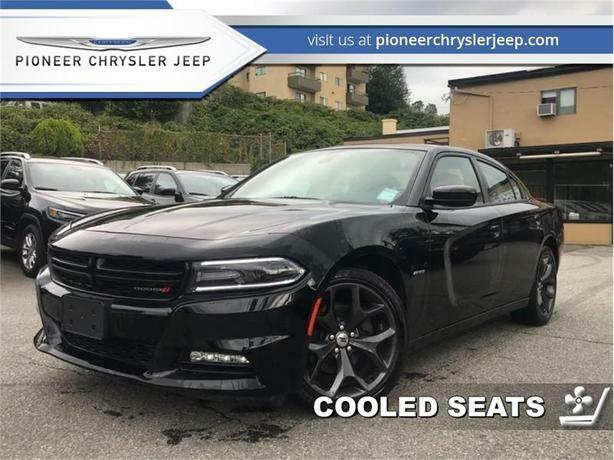 From the driver seat to the backseat, this Dodge Charger was crafted to provide the ultimate in high-performance comfort and road-ready confidence. This sedan has 31835 kms. It's black in colour and is completely accident free based on the CarProof Report. It has a 8 speed auto transmission and is powered by a 370HP 5.7L 8 Cylinder Engine. This vehicle has been upgraded with the following features: Leather Seats, Cooled Seats, Bluetooth, Premium Sound Package, Rear View Camera, Remote Start, Heated Seats. It has some remaining factory warranty for added peace of mind. Our Charger's trim level is R/T. This Dodge Charger R/T is a powerful performance sedan with everyday practicality. It comes with a Uconnect 8.4 infotainment system with Bluetooth and SiriusXM, six-speaker premium audio, leather seats which are heated and ventilated in front, heated rear seats, a heated steering wheel, dual-zone automatic climate control, a rearview camera, rear park assist, remote start, aluminum wheels, and more. To view the original window sticker for this vehicle view this http://www.chrysler.com/hostd/windowsticker/getWindowStickerPdf.do?vin=2C3CDXCT4HH620149. / Total cost of borrowing $7403 ). See dealer for details.